Spotlight articles are written by the PetWise editor based on information provided by pet owners responding to a questionaire provided by the editor. The articles are from the perspective of the pet. Enjoy! My name is Mannie and my pretty boy side kick is Romeo. He is called “Romy” for short. 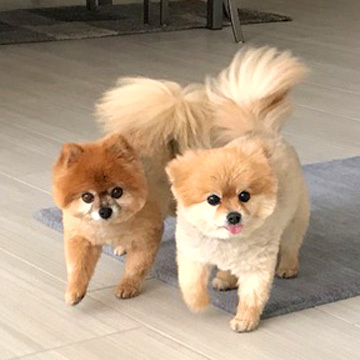 We are Pomeranians with soft cream and orange sable coats, big brown eyes and I weigh nine pounds. However, Romeo loves to eat. He tries to steal my food whenever he can. Romy weighs all of ten pounds. We have been best buddies for as long as I can remember. I am a regular dog that loves to run, play and hang out with the guys. Romeo is a lover and hugger. Sitting on mom’s lap is his favorite thing to do, besides eating. He also loves to play with squeaker dog and chipmunk. Cookies, Candy, and treats, Oh No! Cookies, Candy, and treats, Oh Yes! From Mannie and Romeo, we wish you all a MERRY CHRISTMAS and a HAPPY HOLIDAY SEASON! And, of course, lots of GOOD TREATS!